Save the solar system from invading chickens! Just when you thought it was safe to eat chicken again, the chickens have returned with an organized invasion to take over the entire solar system! Journey to each planet and fight your way through to save the world again! 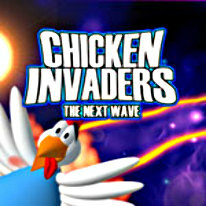 Advance through waves of invading chickens, avoiding falling eggs and collecting power-ups to boost your spaceship's firepower. Fast-paced arcade action for one or two players.